David Love Property is a well-known company in Central Scotland that offers various electrical services to people living in the areas of Edinburgh, Musselburgh and Dalkeith. 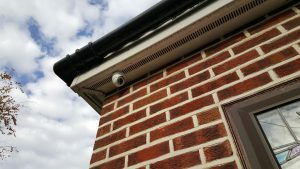 The CCTV camera installation services offered by our electricians are highly recommended by our clients of both commercial and residential premises. We are just a call away from a free quote.. If you are looking for ways to deter unauthorized entry of people in your home or business sector, you can call us to install a digital CCTV camera system. We have many years of working experience and knowledge in this field. We started out in the 1990’s offering fixed camera systems and now we offer HD DVR CCTV systems which have remote viewing, online viewing and remote backup. David Love Property installs CCTV for various security needs. The CCTV camera does not only work as a deterrent but also it helps in keeping constant surveillance of the property. We can install a huge range of products that will meet your requirements like the basic observation system to the total integrated networked DVR. Our digital CCTV installation has some key benefits. They have instant playback, you just simply need to put the time and date. Our DVR’s have motion detection alarms. They provide crystal clear images without distortion. You can email footage and video clips. Video can be instantly burned to DVD’s, the DVR’s have local and remote network administration. A CCTV system can help in reducing crime, provide evidence for insurance reasons. Get a free quote by an electrician for CCTV installation in Craigmillar, Pilton, Drylaw, Muirhouse, Silverknowes, Bonnington and Leith in both commercial and domestic areas. We at David Love Property have been working in this sector for many years and we know the exact procedures for installing CCTV systems. We have affordable charges for the services we provide. We do not have any hidden charges. We try to keep the cost down but now compromising the quality of the services that we are providing. If you want to know the costs of services, call us now at 074131343974. We will come to your site and will suggest the best type of CCTV camera system for your needs. We supply and fit remote access CCTV/DVR systems at any places around Edinburgh, Tranent and Dalkeith. You can protect your home with the help of a CCTV camera system. We supply and fit traditional and dome-shaped cameras. These help in deterring potential burglars. We also provide CCTV camera installation services at business premises as well. The right CCTV camera will help you to reduce the cost of the insurance premiums as well. On our DVR’s, the footage can be monitored through on smartphones / PC and television. Thus, if you thinking of installing a CCTV camera system in your home or the commercial property, feel free to contact our on call electrician on 07413134394.